Treasure hunting husband-and-wife team Sam and Remi Fargo must protect a discovery that redefines Totlec history in this high-stakes adventure from the #1 New York Times-bestselling author. Baffin Island: Sami and Remi Fargo are on a climate-control expedition in the Arctic, when to their astonishment they discover a Viking ship in the ice, perfectly preserved--and filled with pre-Columbian artifacts from Mexico. How can that be? 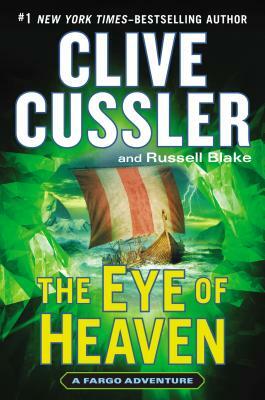 As they plunge into their research, tantalizing clues about a link between the Vikings and the legendary Toltec feathered serpent god Quetzalcoatl--and a fabled object known as the Eye of Heaven--begin to emerge. But so do many dangerous people. Soon the Fargos find themselves on the run through jungles, temples, and secret tombs, caught between treasure hunters, crime cartels, and those with a far more personal motivation for stopping them. At the end of the road will be the solution to a thousand-year-old mystery--or death. Clive Cussler is the author or coauthor of over fifty previous books in five bestselling series, including Dirk Pitt(R), NUMA(R) Files, Oregon(R) Files, Isaac Bell, and Sam and Remi Fargo. His nonfiction works include Built for Adventure The Classic Automobiles of Clive Cussler and Dirk Pitt, and Built to Thrill: More Classic Automobiles from Clive Cussler and Dirk Pitt, plus The Sea Huntersand The Sea Hunters II; these describe the true adventures of the real NUMA, which, led by Cussler, searches for lost ships of historic significance. With his crew of volunteers, Cussler has discovered more than sixty ships, including the long-lost Confederate ship Hunley. He lives in Colorado and Arizona. Russell Blake is the author of twenty-nine acclaimed thrillers, including the Assassin, JET, and BLACK series. He lives on the Pacific coast of Mexico.